Elementary and secondary schools all need lockdown procedures, and so do college campuses of all sizes. Here is why campus lockdown procedures are so important, and some tips on how to make them more effective. Now that most school campuses have been in full swing for over a month, it’s necessary to prepare for every type of emergency. Elementary and secondary schools all need lockdown procedures, and so do college campuses of all sizes. Here is why campus lockdown procedures are so important, and some tips on how to make them more effective. During an emergency situation, it’s easy for everyone to panic. However, panic can only make the circumstances worse. Campus lockdown procedures help teach everyone involved – students, teachers, and staff – how they should respond, whether the lockdown is caused by a weather event or an active shooter nearby. Lockdowns typically involving staying put, turning out all the lights, and staying quiet after a signal is given to initiate the lockdown. That said, numerous factors can make this more complicated than it sounds. Putting it all together, and then putting it into practice. As with fire drills, lockdown procedures must be practiced and rehearsed, whether or not they are announced beforehand. However, it is important to stress that lockdown drills are only drills so that there isn’t confusion about if the threat to the campus is actually real. Threat identification is another vital part of creating the best possible campus lockdown procedures. School resource officers and others in charge of security need to be notified whenever an intruder enters school grounds. Communication is vital, especially from teachers or students who might be able to identify a threat before administrators can, even though it is typically only administrators who can initiate a lockdown. 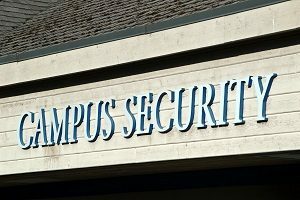 Cameras, access control systems, and alarm systems are all necessary pieces of security technology that can help make a difference during an emergency, especially if the campus needs to go into lockdown. Identify the situation: The first and most vital step is to identify the emergency, and why the campus lockdown procedures are needed. Communicate: Mass notification systems should be used to alert everyone who is on campus and is coming to campus that lockdown measures are about to be in effect. Shelter: Instruct everyone to shelter in place, barricading windows and doors and closing blinds and shutters. Locking doors and improvising defensive measures is also necessary. Wait: Then wait for the all-clear signal before coming out of lockdown. Training is crucial for ensuring all of these steps are followed without incident. This entry was posted on Tuesday, October 2nd, 2018 at 10:45 am. Both comments and pings are currently closed.